You are here: Home » Of Course, Grands! 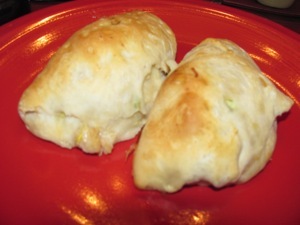 The other day I made this recipe, Chicken and Biscuit Pockets, for lunch. 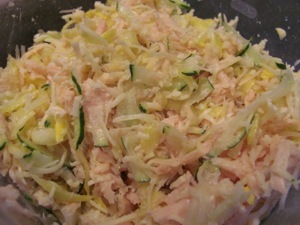 Having shredded zucchini and squash in it, I was wondering how it would be received by my youngest son. They came out of the oven, and I put one on his plate. He took a bite then looked at me and said that it was good. He then asked what was in them. They were really good and as I substituted zucchini and yellow squash in place of the summer squash, I can see a lot of variation working here. I also had some Jarlsberg cheese I wanted to use up so I put that in place of the Cheddar or Monterrey Jack. The mayo and mustard are for a dip. 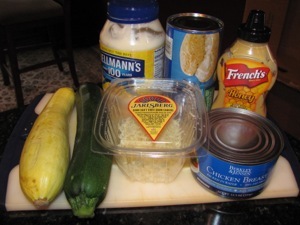 Shred the squash and mix with the cheese and chicken. Roll out the biscuits just a bit, place a scoop of the chicken mixture inside then fold over and pinch the edge shut. Preheat oven to 400 degrees F. Separate biscuits and flatten each with the palm of your hand to a 3-1/2-inch circle. 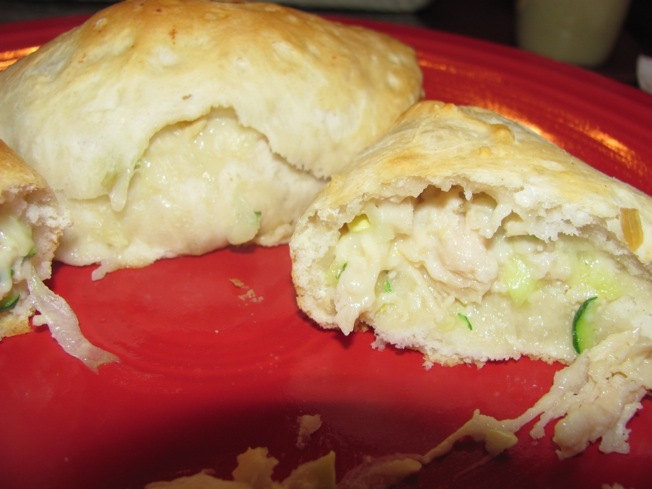 Divide chicken, squash, and cheese evenly among dough circles, placing filling on one side of each dough circle. 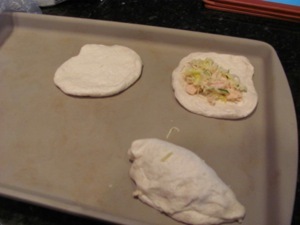 Fold the other sides of dough circles over filling; pinch edges well to seal. * Arrange filled biscuits on an ungreased baking sheet. Bake in the preheated oven about 10 minutes or until golden. Meanwhile, in a small bowl, stir together mayonnaise and mustard. 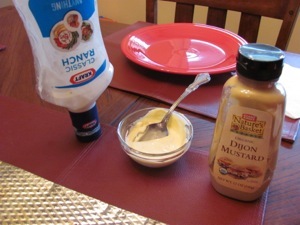 Serve mayonnaise mixture and ranch dressing as dipping sauces for warm biscuits. Makes 5 servings. Very nice. I’ve always wanted to do a homemade take on Hot Pockets. Should I make my biscuits by hand or does store-bought hold up better? Question: did you pair anything with this or just did the biscuits? I think we had a bowl of mixed fruit with it. I’m sure it would pair with quite a bit, though.